Happy people are packing the Innsbruck Christmas markets – straight after a day in superb early season snow. There are several Christmas markets located across the city, so much so that Christmas markets crawls aren’t uncommon. We have sampled the Innsbruck Advent Market scene, so you can arrive prepared and make the most of the Glühwein, sausages and cakes. The most intimate and famous Christmas market in Innsbruck, the Old Town market is located beneath the famous Golden Roof and amongst the ancient buildings in the heart of the city. Gaze above the Golden Roof and the snow-laden Nordkette mountains come into focus, towering over the city. When the Christmas market closes for the evening there are some great bars to warm up in. Heading south out of the Old Town, the Maria Theresien Straße Christmas market is waiting some 100m or so away. 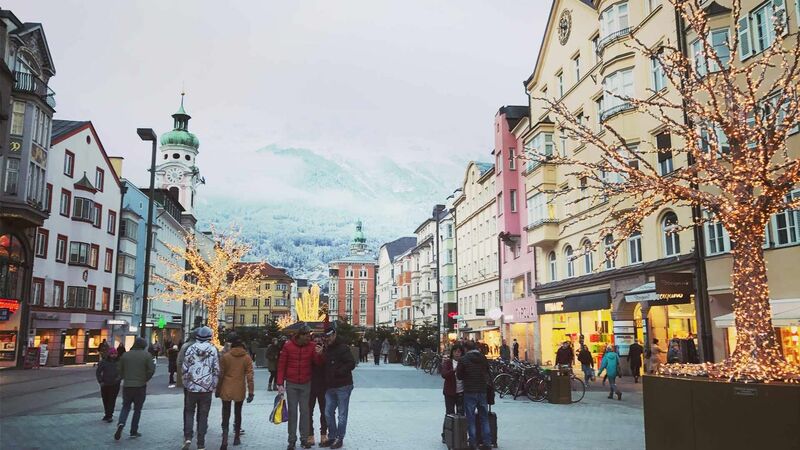 With similarly stunning backdrops, the Maria Theresien Straße market is situated in the more spacious, main shopping street of Innsbruck. Like the Old Town Christmas market, the Maria Theresien Straße Christmas market offers drinks and food as well as handicrafts and souvenirs. After the market closes, there is a great range of bars and restaurants in the vicinity. The other main Christmas market in the heart of Innsbruck, the Marktplatz Christmas market is located on the banks of the river Inn and has wonderful views onto the northern part of the city and the Nordkette mountains. Donkey and fairground rides as well as souvenirs, food and drink are offered. From the Innsbruck Congress centre on the edge of the Old Town, the super-modern Hungerburg funicular leaves an underground station and climbs the northern mountains above Innsbruck. At the terminus point, there is the small, exclusive suburb of Hungerburg, which hosts a Christmas market on a terrace overlooking the city. For views across the city, nothing comes close to Hungerburg. On the edge of the shopping centre of Innsbruck is the suburb of Wilten which hosts a small Christmas market in the pedestrianised area. Far less extensive than the Maria Theresien Straße and Old Town markets, located to the north, the Wilten Christmas market has a great local’s feel to it. Located amongst the labyrinth of the Old Town, the Fischerhaeusl market is located at the back of the Fischerhaeusl restaurant. The market is small and intimate and was traditionally the last to close in the evening, making it a big hit for those touring the various Christmas markets. On the edge of the Old Town, the Stiftskeller Christmas market is situated on the summer terrace of the Stiftskeller restaurant and has a number of stalls serving food and drink. Hemmed-in by the restaurant, the Stiftskeller market has a great feel to it.